How is Gasoline Relate to Childhood Lead Poisoning? To improve automobile performance and fuel efficiency, gasoline manufacturers began adding lead to their products in the 1920s. 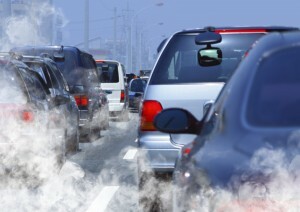 Until government regulations eventually phased out this practice during the 1990s, millions of cars emitted exhaust fumes containing significant levels of very fine lead particles.1 The wind carried these particles across vast areas where the lead eventually deposited onto the lawns, gardens, schoolyards, parks and playgrounds where young children live and play. Why is Leaded Gasoline Still a Problem? It is estimated that the 4-5 million metric tons of lead used in gasoline products now resides in the soil of city and suburban properties across the United States2 where it will remain until there are cost-effective methods to remediate it. When children play outside they are susceptible to breathing lead contaminated dust particles and ingesting them when they play in the soil and then put their hands in their mouths. Sixty years of leaded gasoline use has generated an ecological disaster which continues to harm a new class of children each year. The best solution will be new remediation technologies that can be easily and inexpensively applied to a vast number of properties. 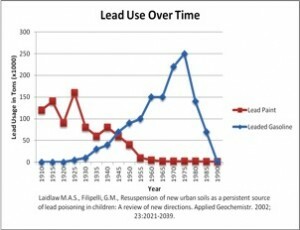 How Does Lead from Gas Compare with Lead Paint? Both sources of lead became the subject of government regulations in the 1970s because even tiny amounts of either can cause irreversible health problems. However, there is a major distinction. While lead-based paint started to fall out of favor in the 1940s, leaded gasoline remained widely used and continued to cause high level emissions well into the 1980s (Figure 1). Figure 1: In the era of leaded gas, the wind carried leaded Exhaust particles into residential areas. What has Been Done About Leaded Gasoline? Further, discouraging the use of leaded gasoline, the U.S. government required new cars to include engines with catalytic converters on their exhaust systems which would only function with unleaded fuel. The government also required the fuel inlets on new vehicles to be manufactured with smaller openings so that the newer cars could not accidently be filled with leaded gasoline dispensed from larger sized nozzles. These and other incentives led to the gradual elimination of vehicles burning leaded gasoline. By January 1, 1996 the use of lead additives in motor vehicles was prohibited with just a few minor exceptions involving small aircrafts with piston engines and some styles of racing cars. Does Lead in Soil Disappear Over Time? Soil deposits from leaded gasoline, paint chips and industrial emissions represent the primary sources by which a vast majority of children are exposed to lead.6 Because these lead particles do not dissipate, biodegrade, or decay, lead in soil will remain a pervasive and long-term cause of childhood lead poisoning.2 The only solution is development of inexpensive and easy to apply remediation methods. Preventing Lead Poisoning in Young Children, Centers for Disease Control (CDC), October 1991.